Visually intriguing, these amazing Mary Ellen Jasper tumble stones are from the Mary Ellen Mine located in the Mesabi Range, Minnesota, USA. The combination of beautiful deep blood red jasper mineral with oxidized metallic swirl patterns of associated iron ore is from the Biwabik Iron Formation and contains fossilized stromatolite specimens. 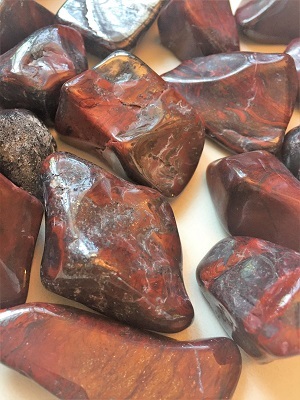 These Mary Ellen Jasper tumbled stones are powerful energetic tools as they have the combined vibrational properties of Stromatolite, Jasper and Hematite. Stromatolite fossils are created from 2300 million year Cyanobacteria (blue-green algae known as Collenia undosa). Stromatolite fossils represent our earliest and most pervasive record of life on Earth. Cyanobacteria thrive in extreme environments due to their relative lack of complexity. Once the dominant life form on the planet, Cyanobacteria is responsible for the creation of Earth’s oxygen atmosphere past and present. Stromatolite fossils represent the energies of the earliest evolution of life on Earth. Energetically, they offer one support and persistence when coping and dealing with extremes. Stromatolite fossils remind us of the important connection to the essence of life. 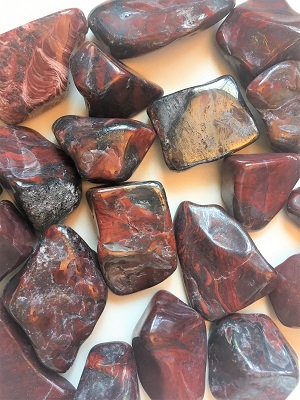 With it soothing vibrations, red jasper is known as a nurturing crystal that is energetically supportive over the long haul, enhancing levels of endurance and stamina. Red Jasper is a powerful stabilizing stone creating balance and well-being. 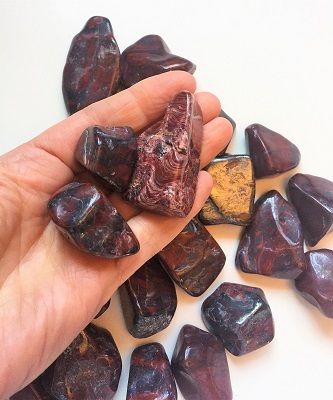 Over time, Red Jasper may increase life force energies and strengthen the grounding connection between the earth and the root chakra. Red jasper encourages one to follow their passions, creative impulses, and get busy doing whatever contributes to their overall well-being. Red jasper lends energetic support to follow through accomplishing goals with persistence and determination. Red jasper helps one face challenges and perceived problems with integrity and courage. In healing, Red Jasper cleans and stabilizes the aura and is a stone of health, strengthening and detoxifying the circulatory system, the blood and liver. Red Jasper may be helpful in dissolving blockages in the liver or bile ducts. The metallic swirls of oxidized Hematite provide energetic avenues for grounding and harmonizing the mind, body and spirit. Hematite is a stone of integration. Hematite facilitates the path to a peaceful way of being. Following the Law of Attraction – “Like attracts like,” Hematite is helpful for those manifesting dreams into reality. 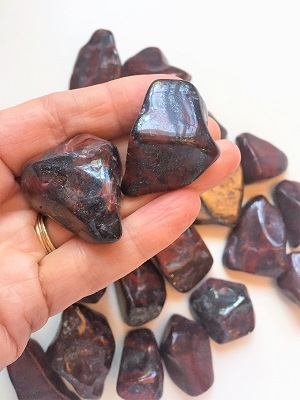 Hematite dissolves negativity, boosts self-esteem, and encourages goal setting and to “reach for the sun.” Hematite helps one to realize the only limitations in existence are those from one’s own mind and ego. In healing, Hematite supports healthy the kidney function and blood. Hematite may be helpful with the regeneration of tissue. Hematite stimulates the absorption of iron and the formation of red blood cells. Hematite may be useful in de-toxing and strengthening the liver.